Last Tuesday, the Craccum editorial team (minus those in class) had our first official editorial meeting. So naturally, we ventured up to Shadows to grab a jug of Shadows Draught and review their toasted sandwiches. Shadows’ toasted sandwiches are truly iconic; beginning at just $2 for a cheese toastie and with an extensive range of options, they’re a solid choice for any mid-afternoon snack, and they do the job of accompanying a Shadows Draught quite well. Cheese and Pineapple was a controversial pick for the team. Especially as our team is not a fan of pineapple with savoury food options, nevertheless we persisted for the sake of journalistic integrity. Pineapple as suspected was not well liked and it was the only one that we didn’t finish. Value: If it was $2 yeah, but it’s $3 so nah. Cheese and Ham is a standard classic. However, this ham was diced and not sliced which did cause some contention between our writers. There was also an overwhelming sense that the ham was not quite as tasty as the bacon, although bacon is a hard meat to beat. Value: Nope, not at all. Pay the extra $1 for bacon and be happy with your choices. Egg appeared on the options as a strange choice, but because we are committed to fair and comprehensive coverage, we decided to give it a go. We did however have some later debate about whether there was actually cheese in the toastie. 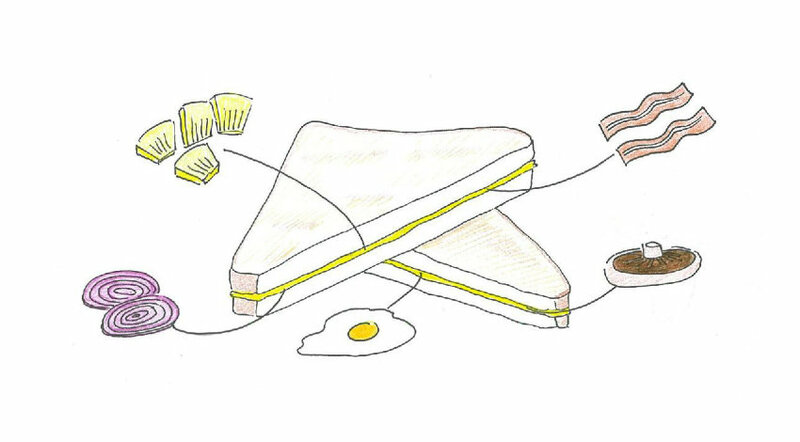 Ultimately, we do not recommend egg in a toasted sandwich; it just doesn’t feel right, unless you maybe added bacon and then you’ve got some sort of breakfast hybrid. Value: how much does a single egg cost? Cheese was a standard choice and one that couldn’t be overlooked. At only $2, it was our cheapest toastie of the lot. Cheese went down a treat with no complaints from anyone. It didn’t set out to be a boujee toastie but it did its job well. Ka Pai. Cheese and Mushroom was only $3, yet the use of Portobello mushrooms added a true touch of class. Our team didn’t dislike this toastie per say, but we can’t say it was the best one of the lot. Cheese and Onion was a moderate option, and at only $3 still a bargain – as all of these toasties are. Cheese and Onion’s likeability was truly dependent on everyone’s own personal thoughts about onion. Regardless, still worth a go. Cheese and bacon is a winning combo. I know it, you know it, and Arnotts shapes knows it. Craccum had high expectations for this toastie and they were delivered on. Cheese and Bacon was the Star of the Show and is our supreme winner.